Jeff Cable's Blog: Here is all the camera equipment I am taking to the Olympics! 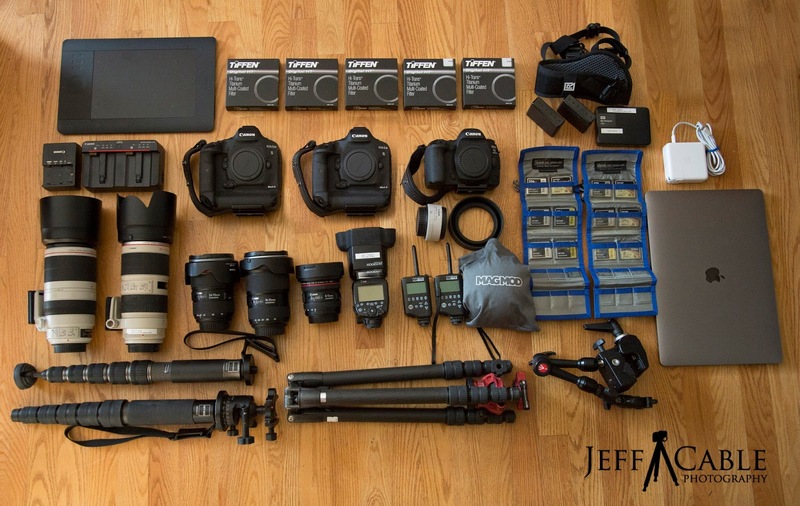 Here is all the camera equipment I am taking to the Olympics! Guess what everyone - I am leaving for the airport and about to get on my flight to Korea! I will check my big suitcase (which is full of heavy clothing for the cold winter - but we already covered that) and have the two camera bags with me as carry-on. 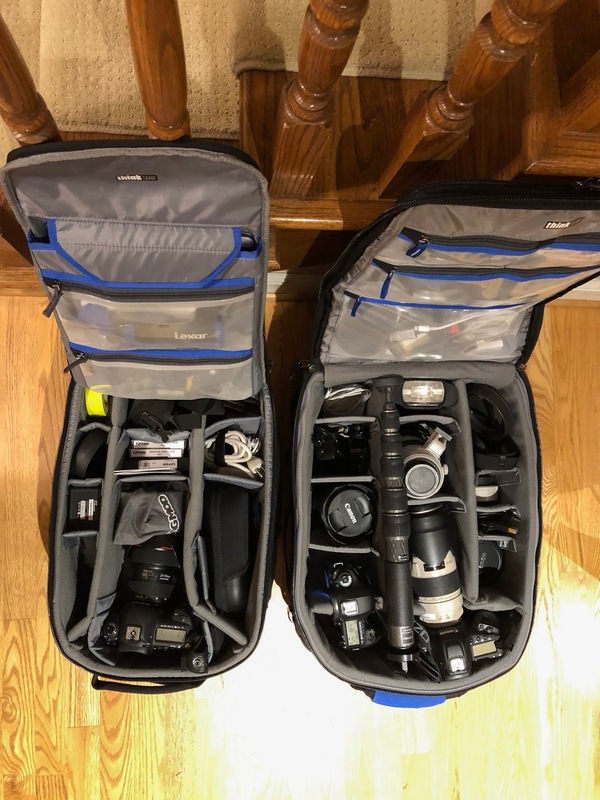 Most of the bigger lenses are in my Thinktank Airport Security 3.0 rolling bag, while the Streetwalker Rolling Backpack 2.0 has some of the smaller lenses, accessories, Bose noise cancelling headphones and laptop. Many people have written to me and asked what camera equipment I am taking with me to this Olympics. So...before packing it all up, I took this photo with a majority of the equipment spread out for you to see. As you can see, I am taking two Canon 1D X Mark II cameras, one Canon 5D Mark IV camera and a large assortment of lenses. For the lenses, I am bringing the Canon 100-400mm, Canon 70-200mm 2.8 II, Canon 24-70mm II, Canon 16-35mm III, Canon 8-15mm fish eye lens. What is missing in the photo above is the awesome Canon 200-400mm lens with the built-in teleconverter. That will be my primary lens for many of the shots at the Olympics in PyeongChang. Canon was nice enough to furnish me one of these lenses in Korea, saving me the hassle of hauling it half away across the world. 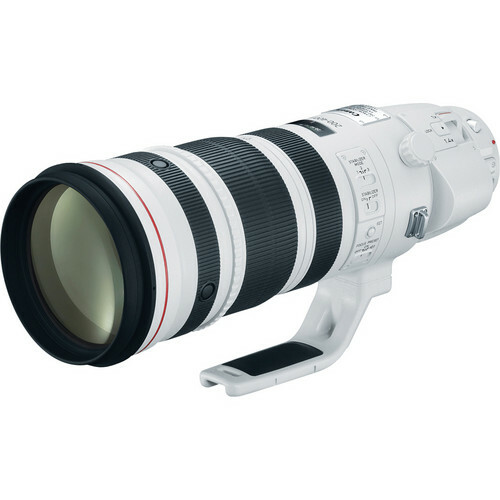 Oh, I will also have the Canon 1.4x teleconverter for the 70-200mm and 100-400mm lenses in those rare times when I may not have the 200-400mm lens with me. The cameras and lenses are really important for shooting the Olympic Games, but there are a lot of accessories that are equally important. I am bringing one Canon 600EX-RT flash for those times when I might need a flash. We are not allowed to use a flash during any of the sporting activities, but can use it during the athlete interviews and I will use it when photographing any of the Team USA athlete parties. Along with the flash, I am bringing one of the MagMod Magsphere dome diffusers for indoor shooting. I am bringing two of the PocketWizard MultiMAX II radio triggers for the times when I want to remotely trigger a camera. To hold the remotely mounted camera, I am using the Manfrotto Magic Arm. Even though tripods are not allowed in the Olympic venues, I always bring my Gitzo travel tripod and Acratech ballhead with me, for those occasional night shots. You will see two Gitzo monopods in the photo. I am bringing two of these (one as a backup) since the monopod is so essential for the Olympics. There is no way I want to handhold the Canon 200-400mm lens (8 lbs) for three weeks. At the London Olympics I left one of these on a press bus. I did get it back, but it made me realize that I need a backup for future Olympic Games. You will see a bunch of the Tiffen HT filters. I have these filters in front of each of my lenses. Most of them are UV filters to protect the lenses from the elements, but I am also bringing a couple of ND filters to allow me to shoot motion pan shots (slow shutter speeds) even in bright light. I am bringing a small Wacom Intuos graphics tablet since I love editing my photos with this. I won't be able to use this when editing photos during the hockey games, because I am editing on my lap right next to the ice, but plan on using it for many of the other events where I do not have a 15 minute deadline. To handle that fast deadline, I will once again be using really fast memory cards and readers. I am still using my Lexar 3500x CFast cards and USB 3.0 readers, and will be playing with some new cards as well. Speaking of editing, all of this will be done on my trusty MacBook Pro 15" with Touchbar. This machine has a 1TB SSD and is really fast. Not only that, but the screen clarity is excellent which really helps when jamming through thousands of photos to find the winners. At the top right of the photo you may be able to see two portable 512GB SSD units and a 4TB WD Passport drive. Those will be used for local backups, and I have a third portable SSD which has my computer cloned. In case of a major meltdown of my laptop or it getting stolen, I can get a new MacBook Pro and clone my drive right over to the new computer and back up and running quickly. And as I mentioned in the last blog post, I will be remotely backing up to my Drobo 810n back in California. I will have a couple of BlackRapid Sport Breathe camera straps with me since they save me from getting neck strain. I guess it goes without saying that I will have lots of batteries and chargers for the cameras, flash, and phone. The cold weather will drain the batteries faster than I am used to. Since I mentioned the mobile phone, I have to give a shout out to AT&T. I called them a couple of days ago to sign up for their International plan only to find out that anyone going to the Olympics has free roaming for the month. Yes...that means I will have unlimited voice, texting and data for the whole time in PyeongChang. I will be in WiFi coverage most of the time, but it is nice to know that when I am out of WiFi coverage I can still use my iPhone X to keep in touch with the family and be productive. 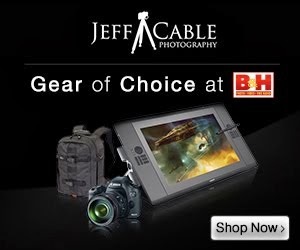 B&H has created a page with all of these items in one place if you want to look. Here is the link. If you look back at the first photo, you will notice that I have my Canon 5D MK IV with the 24-70mm lens attached. I am hoping to get some photos on my journey to PyeongChang, to show you how that goes. The plan right now is to fly United Airlines (official carrier of Team USA) directly to Seoul and then take a bullet train to Gangneung, the area where I will be living in press housing for the rest of the month. If all goes well, the next blog entry will be from PyeongChang. After two years of planning, I can not tell you how anxious I am to get this going once again! Jeff, am curious. How do you get huge image files to backup to your 810N at home over crappy hotel wifi ?? roughly speaking, 50,000 images over 16 days is over 3100 images a day AVERAGE. given your gear, these files are BIG, even if you shoot only JPG, and I'm guessing you shoot RAW+JPG just so you have the flexibility. fast cards and fast card readers and fast SSDs won't help get the files back to the bay area... if you have some free time (hahahaha), would love a blog post on how you accomplish this while running between venues, uploading to client and wire services, and the occasional meal and a few hours of sleep. looking forward to reading and seeing your adventures....thank you for sharing with us. My Olympic wish came true today!!! The quest for just ONE image! High winds wreak havoc at the Olympics! My worst day EVER at an Olympics - The story!